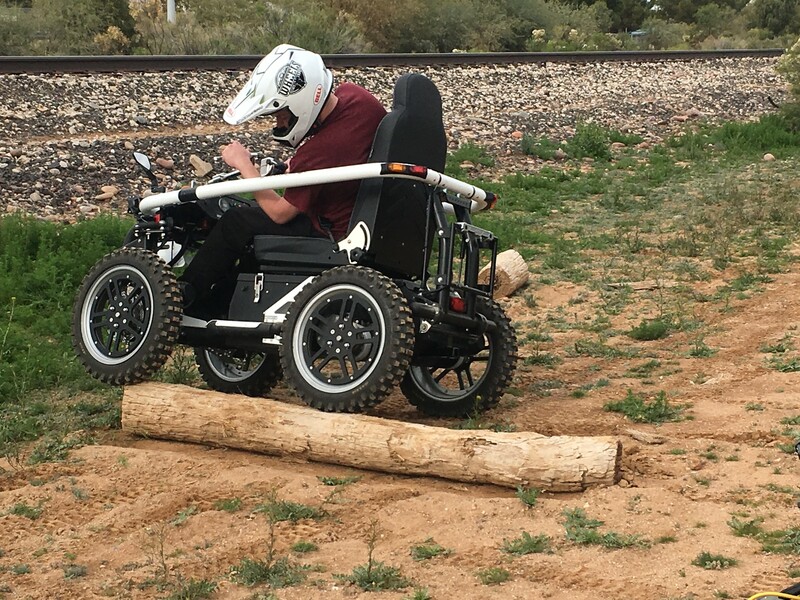 A month or so ago, Jason Weigandt and I somehow ended up on an email blast chain by an off-road wheelchair company, looking for media outlets to notice their product—the Terrain Hopper. Little did they know, that here at Racer X Online we just so happen to have somebody on staff WHO ACTUALLY USES A WHEELCHAIR! After a few weeks of back and forth emails, I was able to convince the company to let me test ride one of these things—I mean, how can we review a product without actually using it, right? 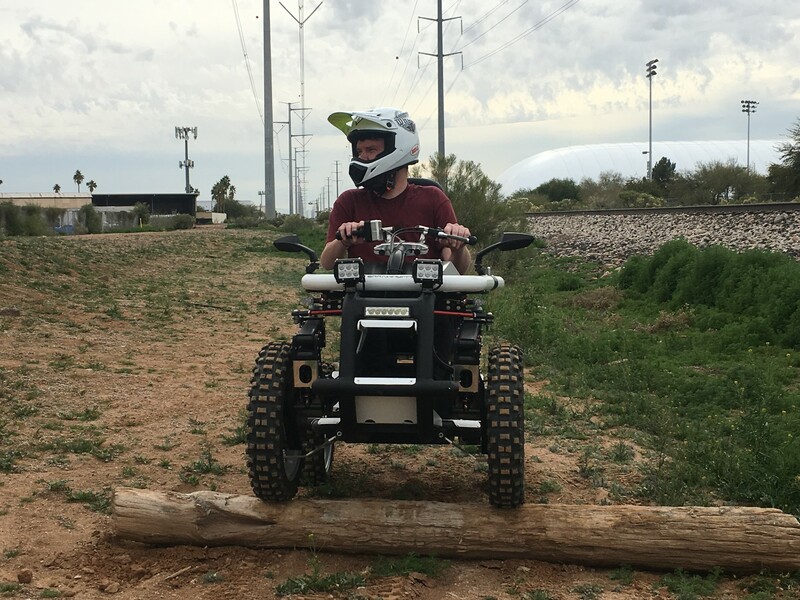 Thursday afternoon prior to Glendale Supercross, I rolled into Tempe, Arizona to see what these Terrain Hopper machines are all about. Picture a wheelchair that has 4 knobbie tires (about the size of a 110 pit bike wheel), an electric motor, and handlebars. While this machine is technically a mobility device, I definitely wanted to see what it could do—realistically this is a toy that is perfect for individuals who love being outside but have difficulty walking. The model that I rode had a “high speed”—about 14mph—and a “low speed”—about 5mph but torquey to climb rocks and stuff. The 14mph mode is kind of fun, I tried that setting on the road, but when you take this thing off-road and start climbing obstacles is when the real fun begins. I think I spent about 15 minutes just messing around on a log that I found lying on the ground. It was obvious that the owner of the company wasn’t exactly used to motocross dudes riding his equipment when he pulled out his camera to film me playing on the log. “No one’s done that here on a test ride” he laughed as I went forward—then reverse—with just 2 wheels sitting sideways on the busted chunk of wood. Wheels on some different wheels. Todd Lemay is the founder, and deals with medical issues himself. Thanks to the Terrain Hopper, he admits that he was able to feel the ocean for the first time ever. Yes, he rode it into the water—I saw a photo, it was cool. I don’t want to get into the specs of this machine, because I’ll probably get them wrong. However, you can check out their website for all of that stuff. www.terrainhopperusa.com. Ultimately I’m excited to have had the chance to ride one of these, and look forward to possibly showing up to a Pro Motocross or GNCC race in one in the future. A person who enjoys outside activities could spend hours in a Terrain Hopper. Hopefully one day I can take this thing out on a real trail ride! Below are a few photos and videos of my day.